Thiroux's resume already includes performances at jazz festivals in the United States, Mexico, Germany, Finland, Serbia, and Singapore, both as a leader and sideman. 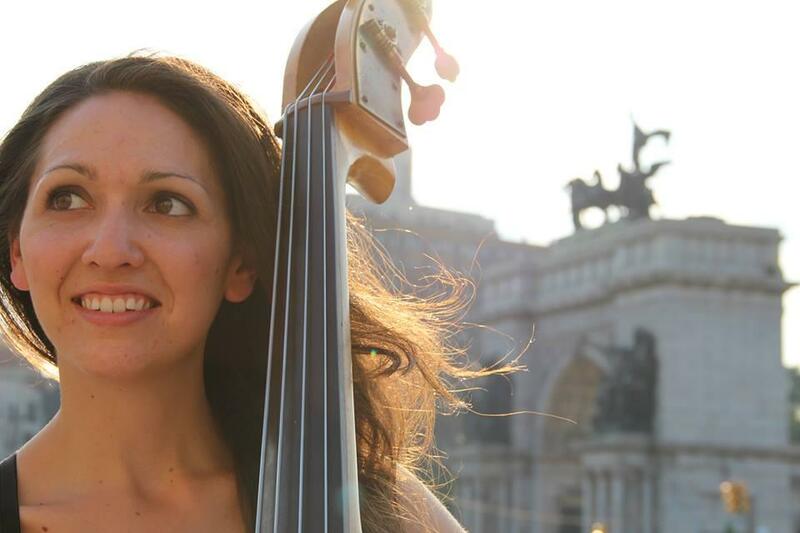 Katie Thiroux, 26, a gifted string bassist and singer/songwriter from Los Angeles, celebrates the release of her fine debut disc at 8:30 pm on Friday, February 6, as she leads her tight-knit quartet at The Side Door Jazz Club in Old Lyme. If you’ve never even heard of this melodic, rich-toned bassist and fluent singer -- a two-in-one instrumentalist/singer package in the swinging, non-commercial mode of the early recordings by singer/pianist Diana Krall -- then you’re in for a pleasant surprise at the popular shoreline jazz spa. You might even be doubly pleased by both Thiroux and her swinging, simpatico sidemen, tenor saxophonist Roger Neumann, guitarist Graham Dechter, and drummer Matt Witek. A genuine working band, this is the same lineup heard on Thiroux’s plainly titled new disc, Introducing Katie Thiroux. 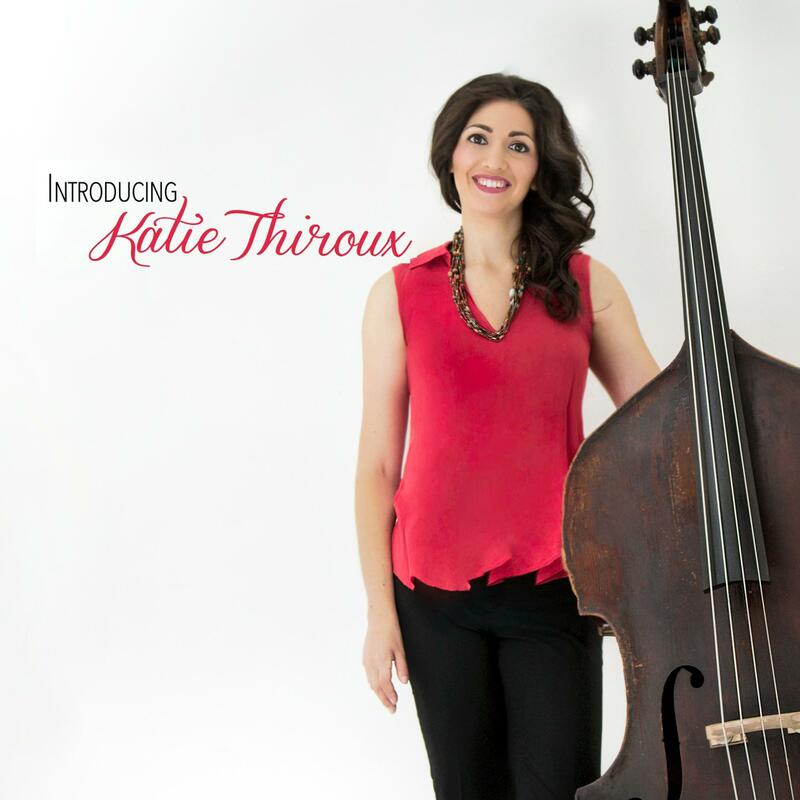 Right from her album’s opening track, “There’s a Small Hotel,” Thiroux sets a bright, high standard as a bassist with good time, tone and ideas. A selfless player, she’s as happy as a soloist as she is as a contributing ensemble member. While it’s her debut album, she’s obviously inspired by the sheer pleasure of interacting with her sidemen. At the same time, she’s a deft singer who can weave concise, hip embellishments without tearing apart the original melodic fabric of a song. As an instrumentalist/singer, Thiroux is reminiscent not only of early Krall, but also shows touches of Peggy Lee’s savvy, gracefully natural way with lyrics. Adding to that is her love for the adventurous elements of Anita O’Day and Ella Fitzgerald, and her taste for the unflappably cool Chet Baker, who could sing an old song almost note-for-note, yet, amazingly, transform it into something new and dramatically alive. Thiroux’s grand finale on her premiere release is a moving a cappella double bass rendition of Rodgers and Hammerstein’s Oh, What a Beautiful Morning. Free of histrionic pyrotechnics, it’s an impressive example of her signature style, which is direct, forthright and expressive. Rather than trying to impress with sheer string and vocal fireworks, she focuses on selecting the right note at the right time, at a young age, proficient at self-editing, which is both a demanding process and a true measure of craftsmanship. Always playing in a groove, Thiroux achieves success and wisdom without going down the more commonly taken road to excess. Along with crisp renditions of such standards as “I’m Old Fashioned” and “The One I Love Belongs to Somebody Else,” the quartet also digs into several tuneful Thiroux originals, including a sweet but never saccharine ballad called “Can’t We Just Pretend.” A pretty piece, it echoes with the silken romanticism of an Ellington/Strayhorn standard. A clever original called “Rosebird” (inspired by melding Earl Hines’s “Rosetta and Charlie Parker’s “Yardbird Suite”) is a perfect vehicle for the quartet to jam on in a swinging track, a brisk preview of its live show at The Side Door where it can stretch out. Thiroux began on violin at age four, changing to classical double bass studies at eight, before ultimately switching allegiance to jazz bass at 12. She began her dual path as an instrumentalist/singer by beginning vocal studies with the celebrated jazz vocalist Tierney Sutton, who taught her invaluable lessons on how to navigate chord changes. Thiroux focuses on selecting the right note at the right time, proficient at self-editing -- a true measure of craftsmanship. Although Thiroux's personal pantheon includes double bassists Paul Chambers, Israel Crosby (a pioneer best known for his work with the Ahmad Jamal Trio), and Scott LaFaro, the late, great Ray Brown -- a childhood hero she once met -- is her supreme idol for his musical mastery and sharp business smarts. Thiroux believes jazz musicians of all generations must hone business skills in order to insure their independence and fiscal survival in the real world. Paul Chambers caught her ear very early on through his sensational playing with the first classic Miles Davis Quintet, the 1950s dream band with John Coltrane on tenor, Red Garland on piano, and Philly Joe Jones on drums. A big turning point towards jazz and away from classical occurred one day by pure chance when Thiroux was only 12 and was walking down the hallway in school, lugging her double bass. A music teacher stopped her in the hall and said he urgently needed a bass player for a rehearsal with the school’s jazz combo. “I told him I didn’t play jazz,” she said, “and that I probably couldn’t read the notes off the page for a jazz combo. I was a classical bass student. Then he said to me, kind of chuckling, ‘That’s okay. We all learn off recordings, learning together by ear.’ And that’s exactly what we did.” She was perfectly at home with it, even thrilled with the adventure and risk of improvising rather than reading music. By her final year in high school in 2006, Thiroux won a full presidential scholarship to Berklee College of Music in Boston. While excelling in formal studies, she also got to perform with such jazz artists as Billy Taylor, Terri Lyne Carrington, Greg Osby and Branford Marsalis. As an undergrad, she even got to play in such noted venues as The Regatta Bar in the Boston area and The Kitano in New York City. After a post-graduation stint as a music professor at Berklee’s International School program in Ecuador, Thiroux returned home to California to earn her master’s degree at California State University, Long Beach. Again, the academically bright student, as she had as an undergrad at Berklee, went to grad school on a full scholarship. Since receiving her master’s, she’s performed on both coasts, preferring to live on the West Coast rather than in the Big Apple. “New York is a great place to visit, but I love it here. Besides, everything is just a plane ride away from LAX,” Thiroux said. Her resume already includes performances at jazz festivals in the United States, Mexico, Germany, Finland, Serbia, and Singapore, both as a leader and sideman. Besides playing with her working quartet, she has performed with such luminaries as Geri Allen, Helen Sung, Eric Reed, Brian Lynch and Ken Peplowski, among others. Thiroux at The Rochester International Jazz Festival. 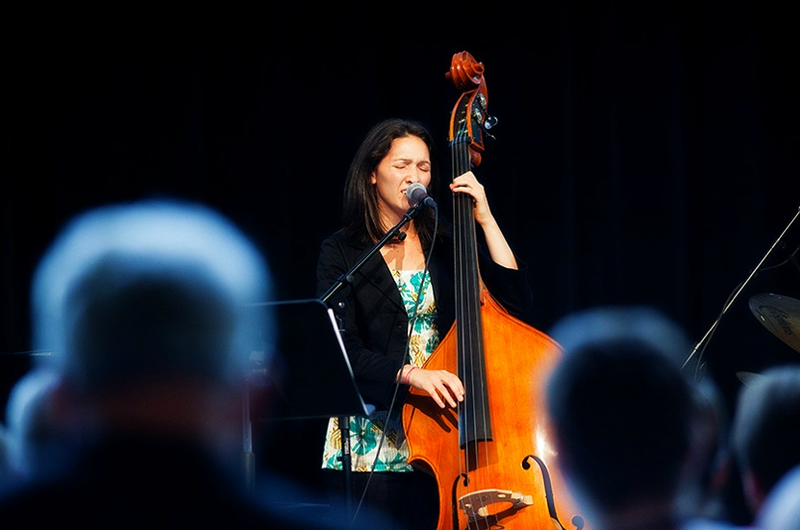 In 2013, Thiroux formed her quartet and later made her debut recording, which was completed under the guidance of her mentor, bassist John Clayton, and produced by the Grammy Award-winning drummer Jeff Hamilton. In a stroke of good fortune, the quartet came about when Thiroux and three friends decided to get together the day after Thanksgiving for a little, informal jam session with absolutely nothing permanent in mind. On a quick, mini-eEast coast promo tour, the Thiroux Quartet plays February 4 at The Checkout: Live at Berklee Series in Boston, and on February 5 at The Kitano in New York City, before concluding its run with its Connecticut debut on February 6 at The Side Door Jazz Club in Old Lyme. Side Door tickets: $15.00. Information: thesidedoorjazz.com and (860) 434-0886. Violinist/violist Jason Kao Hwang, an Asian American composer who bestrides the cultural divide between Eastern and Western tonalities, leads his genre-bending quintet, Sing House, at 7:30 pm on Saturday, February 7, in the Pioneer Valley Jazz Shares series at the Arts Block Café at 289 Main Street in Greenfield, Massachusetts. 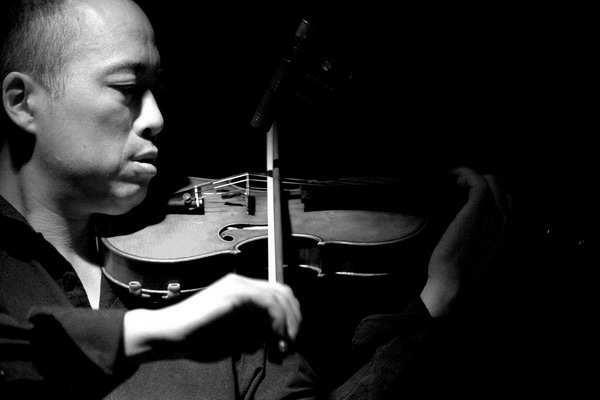 Fluent in classical, jazz, contemporary, world and traditional Chinese musical expression, Hwang will return to the area to perform his recent octet project, Burning Bridges, on April 30 at the University of Massachusetts at Amherst. Commisioned by Chamber Music America, the work -- which, despite its title, actually builds rather than burns bridges between East and West -- features Chinese and Western instrumentalists. The diversified composer’s opera, “The Floating Box, A Story in Chinatown,” was named one of the Top Ten Opera Recordings of 2005 by Opera News. Admission to the Jazz Shares concert: $15.00, available at jazzshares.org and at the door. Vince Giordano and the Nighthawks, an authentic, vintage, Grammy-winning hot jazz band that soared to great heights on HBO’s "Boardwalk Empire," strut their 1920s and 1930s stuff at 3:00 pm on Sunday, February 8, at the Valley Regional High School, Kelsey Hill Road, Deep River. Maestro Giordano, a mix of musician and magician, is a true scholar and master practitioner of classic jazz. His highly skilled ensemble resonates with historic accuracy and exuberant, foot-tapping joy, which is as timeless sounding and intoxicating today as the original music was back in the heyday of flasks, flappers, flagpole sitters, rumble seats, raccoon coats, Al Capone, Lucky Lindy, the Sultan of Swat, the Manassa Mauler, Red Grange and the Red Scare. Through the magic of Giordano’s flawlessly designed, time-travel machine, The Nighthawks make a slice of our cultural history seem like only yesterday. Tickets: $35.00, general; $5.00, full-time students, available at essexwinterseries.com or (860) 272-4572. Old-time sounds and the remembrance of tunes past also rule at 3:00 pm on Sunday, February 8, as the Hartford Public Library’s free Baby Grand Jazz Series presents the Survivors Swing Band, an intrepid, Connecticut-based combo dedicated to celebrating Swing Era material. The peripatetic septet has presented its old but zesty mix of swing and nostalgia throughout the state, entertaining in malls, libraries, restaurants, backyard parties and even cutting the mustard and playing with great relish at, yes, a hot dog stand. Information: hplct.org and (860) 695-6300. Christian McBride, John McLaughlin, Vinnie Colaiuta and Kenny Garrett. Double bass wizard Christian McBride leads his hard-swinging, expressive trio at 7:00 pm on Thursday, February 5, at the Iron Horse Music Hall in Northampton, Mass. His trio mates are two highly touted and talented, young musicians, the phenomenal pianist Christian Sands and drummer Ulysses Owens Jr. Information: (413) 586-8686. On Saturday, February 7, McBride’s take-no-prisoners troika storms into Connecticut—Sands’ old home turf -- as it presents its robust art of the trio at The Side Door Jazz Club in Old Lyme. That performance has already been sold out, but The Side Door has added a second show for Sunday, February 8. Here’s a chance for Sands’s legion of longtime Connecticut fans to hear their nationally ascending local hero in a premier trio setting that, with the peerless McBride on bass, is probably about as good as it gets. Information: thesidedoorjazz.com and (860) 434-0886.